Filled with funny and poignant songs about dating, parenting, aging and dreams both fulfilled and unrequited, Closer Than Ever is a musical “how-to” manual for life. 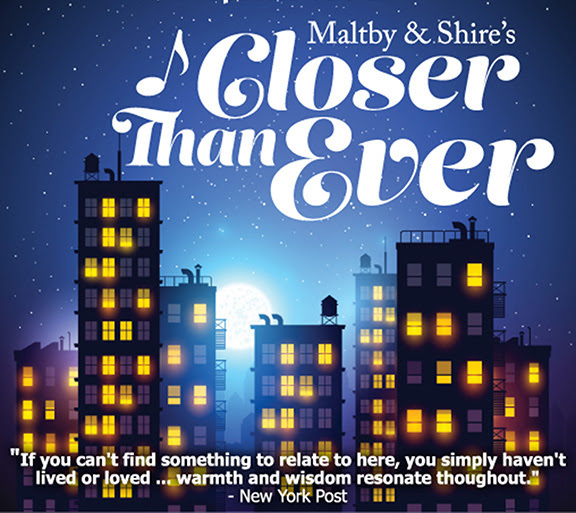 With each song a self-contained story inspired by real-life experiences, this musical forms an extraordinary collection of tales about ordinary people as they make their way through life – and its message to value the little things in life remains timeless. Two dozen wise and witty “songs of experience” with charming melodies and smartly crafted lyrics. 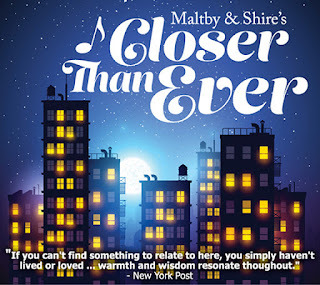 International City Theatre opens its 2016 season with a recently updated version of Closer Than Ever, the Outer Critics Circle Award winner for Best off-Broadway Musical that also netted Drama Desk nominations for lyricist Richard Maltby, Jr. and composer David Shire. Directed and choreographed by Todd Nielsen, with musical direction by Gerald Sternbach, and starring ICT favorites Kevin Bailey(Abigail/1702), Valerie Perri (The Sweepers), Adam von Almen(The Heir Apparent) and newcomer Katheryne Penny, Closer Than Ever opens February 12 at ICT’s home in the Long Beach Performing Arts Center. Two low-priced previews take place on February 10 & 11. For tickets, call 562-436-4610 or check out www.InternationalCityTheatre.org.